we have a private chat built in here onsite. Following is a brief summary of the toolbar. on our multiple sites (blogs, etc). and leave your own posts and comments. Be advised, the comments box IS NOT private, but IS public. important info, links, etc. OUT for your own protection! one by one, to create a universal, and community experience. This little icon is where you will find any site announcements that were made. (not private forums) you will find the feeds running in this little box if clicked. can see your updates, via network rss. Why yes, there is a blog, on Blogger. Read, Follow, Tweet to ZazzleStars on Twitter. Clicking brings up the rss feed. can with the rest of the internet. It WILL bring members, ranking, and attention to our humble place. Share public posts on Pinterest as images that become links back to your posted image. NOTE: as icons and services are added, some icons may be hidden in the center of the toolbar. This would depend on your screen size, etc. You may not see what is there, unless you click the center number. WE HAVE GRAPHIC EDITORS FOR YOU TO EXPERIMENT AND CREATE WITH. 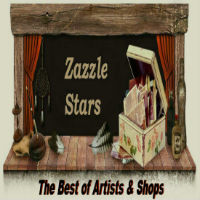 WANT TO PURCHASE AN AD ON ZAZZLE STARS? Learn how, click the below link! LOOK HERE FOR A GROWING LIST OF TOOLS! The onsite Chat module is hidden from non logged in members. It resides on the Forum Index Page. new pop up page. This particular chat module is not guest friendly, so you may feel safe from the entire internet! start as to how awesome your promotional abilities can be. There is one thing I have noticed however, that StumbleUpon seems to be unfriendly to this platform, I am imagining someone using this platform abused it somehow, but they apparantly have the forumotion platform on a ban list, there are work arounds for it, but I use Tumbr anyway.